Home » Blog » SEO Strategy: What Should It Include? SEO Strategy: What Should It Include? Keeping an eye on your content length has a major role in SEO. Have you ever tried Googling your own article, only to find it on the 10th results page? The content was great and still Google gave you the thumbs down. What possibly went wrong? There are a lot of factors in play when it comes to Google ranking you further up the results stream. It’s not just about the information in your content, but the way you display it is equally important. There are many SEO checklists, including content length, that could help you get on the good side of search engines. You might think these guidelines as unnecessary shackles, but they are actually there to help. Search engines collect reader statistics in order to study the effect of parameters like content length. The collected data helps the search engine learn more about what the readers want and rank your content more accurately. No one can say there is a word count that’s one size fits all. That being said, there is an ideal length for each article, and with some tips yours can get close enough. A search engine’s job is to scour the Internet and show you the results most relevant to what you searched for. It’s important to remember that Google doesn’t make the rules but, they’re really good listeners to what most readers want. Imagine Google as Cesar that can give your articles a thumbs up or down if the audience wills it. In other words, in order to please search engines, you need to know what the reader wants. So what does the reader want? A study made by Medium in 2013 suggested that the optimal content length is 7 minutes, but what does that mean? 7 minutes is roughly a little over 1700 words. This number is shocking because it was widely believed that readers get bored reading articles over 500 words and the optimal word count was presumed to be between 500-700 words. They came to this conclusion by ignoring which articles got more clicks and clocking the average amount of time spent on each article. Then they plotted that average against article length in minutes. The results were a curve that peaked at 7 minutes. This result suggests that more isn’t always better, because articles of 8 or 9 minutes’ length had less time spent on them. Does this mean that you should stretch out your content to 1700+ words? It’s still not that simple. It’s all about what kind of content you provide. If you’re looking for a simple answer to a simple question you don’t want to be directed to a 2000 word article, and google knows this. What this study shows is that you shouldn’t be held back by a presumed short reader attention span. You need to categorize your own writing and adjust the content length accordingly. If your content is about tackling a single answered question, it should be brief and to the point, there is no need to drag out the question and confuse the reader. However, if you’re writing an article on a certain study with many aspects, then it’s better to cover every aspect of the study, which means more words. A reader’s attention span is as long as you’ll let it be. If your content is engaging enough your readers would gladly follow you through a 2000 word article. Most Internet users are hungry for long articles as studies show, but they are even more hungry for quality content. Studies show only the average of all users but not the whole picture, and search engines know this. Google ranks your articles on quality not just quantity, so a keyword-dense, long article isn’t all it takes to please their constantly updating algorithms. 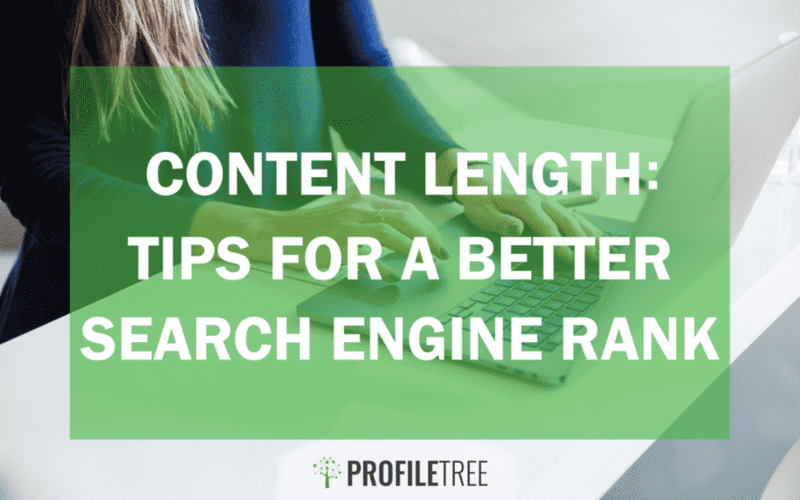 Content length isn’t just about the overall word count, but you’ll need to optimize each component of your article to please the viewers, and show search engines you mean business. There is no way to cheat your way to the top in terms of search results. However, there are a few things to keep in mind always as a backbone to build your article on. The average person remembers the first 2-3 words, and the last 2-3 words of a title give or take; this places the ideal title to be around 6 words. Make sure that there is a place for your content’s keyword in the title, that makes search engines very happy with you, as well as letting the reader know you have what they’re looking for. What good is an article ranking high if no one clicks it? No one wants to read one piece, 1000 word article; it’s exhausting for the eye. Try to separate your ideas into paragraphs under 150 words; you can do that by creating a theme or idea for each paragraph in your head, then building the paragraph from there. The contrast isn’t any easier as well, if it’s not poetry, don’t put every sentence or two in a separate paragraph. Just like content length, you shouldn’t constrain yourself with upper and lower word count limits; in the end do what serves your topic best. An introduction is always a good idea. It breaks the ice between the reader and the article they just met. A good introduction is around 15-18% of the content that’s 150-180 words for a 1000 word article. It should also contain an outline of what you have to offer the reader in this article. For a smoother reading experience, you need to compartmentalise your ideas, and serve them under relevant headers. You start to lose focus after 300 words, give or take. Separating with headers gives the brain a sort of wake up signal, telling it something important is coming, focus! Content length is one of the things that search engines consider before deeming you worthy of the viewers’ clicks. Search engines don’t tell you how to write your articles, what they care about in the end is what’s relevant to the reader, which is also what you should be concerned with most. Quality content is only half of the equation, maybe even less than half; the rest is presenting it in an attractive way. Showmanship is important in keeping your readers happy and loyal. If you click a link for an article and it’s dull and not enticing enough to finish, chances are you will skip that source in the future, even if it’s the first link on the first page.